Hi friends, Whatsapp messages are Full of Fake Scams Nowadays. People Make Shadow Copy of Original Websites & Add their Own Fake Content to it. They do it for Fraudulent activities. It is Dangerous to give your Valuable Information to them. Scared? What is the exact message ? 1 . Amazon will always sell products on their site with domain http://www.amazon.in not on some fake domain name like http://amazon.mobile-flashsale.com/ created 2-3 days before. 2. The message says that the offer is because of Amazon’s Golden Anniversary but there is no such thing. Golden Anniversary means 50th Anniversary whereas Amazon was launched in 1994 outside India and in 2013 in India. 3. Even if Amazon wants to giveaway then they will do it professionally on their own website through some contest like treasure hunt or sweepstakes. 5. Above the “Buy Now” button, it shows – “If you order in next 1 hour and 34 minutes, you get guaranteed delivery by….”. Well this 1 hour and 34 minutes remains the same always unlike amazon where the clock keeps ticking. These guys can stop time also. Genius Minds ! 6. After you click on “Buy Now” and “Proceed to Checkout” >> You will be asked to share the message with 8 friends or whatsapp groups and you will be surprised to know that you can just click on Share and then you will be taken to Whatsapp and you can then press back button without actually sharing in any group and it will be counted as 1 successful share. 7. After you share with 8 friends/groups, you will be asked to download a suspicious app which can harm your phone. After knowing all of this – Do you still want to do that ? Well – Your choice, at the end of day ! 8. English Grammar – There are more grammatical mistakes than the amount of English in their sentences. Some like – “Visit just now”, “For book Samsung Galaxy J7″, “Download our Official App for buy now” and many more……… A top notch company like Amazon can never make so many mistakes. The answer is quite simple – they are doing all these things to get people’s personal data & to get traffic on their website and making them install apps through which they can earn per install and apps which can collect data like all your contacts and much more…. 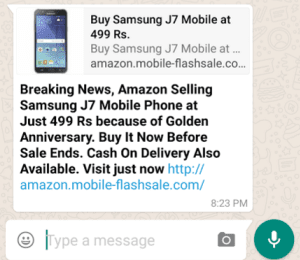 2 Responses to "Scam Alert – Samsung J7 Mobile Phone at Just Rs 499 by Amazon is fake"
U r right admin i got d same msg. when i cheq the url that is not official site of amazone. 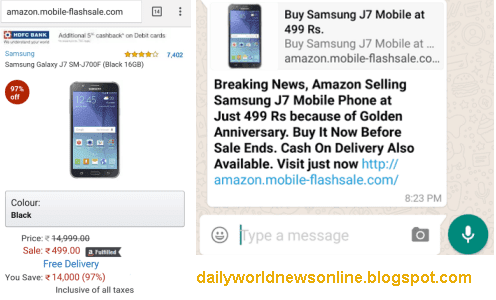 Although, it might be irritating for you to see such scam alert posts on dealnloot ... amazon samsung J7 mobile phone Rs 499 fake scam alert.